…. [Under ACA] the feds will cover 100 percent of the difference between wherever the state is now and where the law wants them to go for the first three years, and 90 percent after 2020. To get a sense of what an incredibly, astonishingly, unbelievably good deal that is, consider this: The federal government currently pays 57 percent of Medicaid’s costs. States pay the rest. And every state thinks that a sufficiently good deal to participate. federal government will pay on your behalf going forward. And that gets to an irony of the health-care law: Red states have, in general, done less than blue states to cover their residents, so they’re going to get a sweeter deal under the terms of the Affordable Care Act. Of course, Texas’s stinginess is also one of the reasons they’ve weathered the Great Recession better than some states. It’s not the only reason, or even the main reason, but it’s part of the story. And a state like Texas, that hates, hates, hates the idea of providing for its poor might hold out against Medicaid expansion a long time, even if the absolute cost to its taxpayers is fairly small. If one industry can claim to have the most riding on states participating in the health law’s Medicaid expansion, it’s near-certainly hospitals. They have nearly $40 billion riding on whether states sign up or not. Hospitals regularly get stuck with bills that the uninsured cannot afford to pay. Every year, the American Hospital Association adds all those bills up to calculate the total amount of uncompensated care that its members provide. Every year, the number gets bigger and bigger, hitting $39.3 billion in 2010. The Texas share of that bill is somewhere around $3 billion per year. So what happens if we sharpen our pencils and account for that? 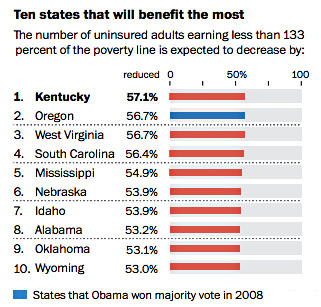 Under ACA, the feds pay for 100% of Medicaid expansion for the first three years, and even after 2020 they pay for 90%. For Texas, this probably means that once Medicaid expansion is fully phased in, it will cost them perhaps $2-3 billion per year, with the rest of the tab picked up by the federal government. That’s a pretty small bill to begin with, but as the AHA notes, Texas and its hospitals are already paying for medical care for the people covered by Medicaid expansion. Some of that comes via emergency care, some comes via indigent care at the local level, and some comes via other state programs. A lot of that could be offloaded onto Medicaid under the new rules, so once you run the numbers it’s possible that signing up for Medicaid expansion is actually a net savings for Texas. No matter how much Rick Perry resents Obamacare, that’s hard to turn down. At worst, the net cost to Texas is probably no more than a billion dollars or so, and at best they might even come out ahead. You’d have to hate the poor an awful lot to block the hospital door for long under those circumstances.